Rev. Drew McIntyre is an Elder in the Western North Carolina Conference and serves Grace UMC in Greensboro, N.C. Born and raised in the Tar Heel state, he was educated at High Point University and Duke Divinity School. Drew enjoys spending time with his wife, playing with their pets, reading, and watching movies. He blogs at Plowshares into Swords (www.drewbmcintyre.com/). Drew also co-hosts the WesleyCast. This article originally appeared on his blog. Re-posted with permission. The quote [below] has been making the rounds on social media lately, purportedly from C.S. Lewis’ classic Screwtape Letters. This is Lewis’ imaginative account of a senior demon (Screwtape) training up a younger tempter (Wormwood). 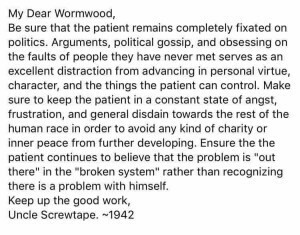 To my mind, the real Screwtape quote is even more relevant today than the fictive pericope. Certainly there is a word we need to hear from the latter about focusing on the drama and immorality of others instead of trying to increase in virtue ourselves. The real Lewis, however, offers a subtler and more important point on the dangers of manipulating faith for our own personal and ideological ends. Many, if not most, forms of popular Christianity (read: Protestantism) are proffered either a) as a means of personal advancement or b) as a means of societal advancement. Both fit demonic desires. Screwtape tells Wormwood they want their victims to “treat Christianity as a means,” preferably to selfish ends but also to more noble ends if necessary. This is a subtle but crucial point – a “little rift” as Screwtape calls it. Christianity turned into a means is thus embraced not because it is true, not because, say, Jesus really is the Messiah of Israel and the world’s true Lord (N.T. Wright’s lovely formulation), but because Christian faith gets you from point A to point B. Even if point B is something desirable like “social justice,” we (Screwtape’s victims) have successfully reduced Christianity from an end to a means, from the truth on which the world turns to just another way of achieving some desired outcome. St. Augustine noted long ago, there are things that can be used and things that can be enjoyed. Only God can be truly enjoyed, for all other things are to be used or enjoyed only in reference to God. The temptation to make faith a means to anything else is to attempt to use God rather than enjoy God. This makes the God of Abraham, Isaac, and Jacob into little more than a glorified genie. Much like fictive quotes associated with John Wesley, the real Clive Staples is better than the invented. There is a reason he is still influential decade after his death. Few have put so eloquently or so readably what is at stake in Christian believing and Christian living (which, in his brilliance, he did not divide). So perhaps we’d be better off if we made this last quote famous, since it cuts to the heart of all our idolatries. What better way to honor a teacher and writer whose legacy is the simple but radical project he named “mere” Christianity? What are you other favorite quotes from Lewis? How else do you see the temptation today to turn Christianity into a means rather than an end? Leave a comment below – and don’t forget to subscribe! Source: Lewis, The Complete C.S. Lewis Signature Classics, p. 253. P.S. The first Methodist to say that social justice is a core aspect of the gospel because they’ve conflated it with social holiness loses points. I was looking for discussions of Lewis and Alasdair Macintyre, and the google search turned you up. But your discussion regarding means and ends I think is very relevant to what I was looking for. Specifically I wondered if there is discussion over each of their critiques of emotivism (Lewis in Abolition of Man, and Mac in After Virtue) and if there are Protestant counterparts to Macintyre today (ie, Calvinist Aristotelian Thomists) I think of the quote from Holderlin, which I lifted from Hayek’s Road to Serfdom: “What has always made the state a hell on earth has been precisely that man has tried to make it his heaven.” In other words, If we attempt to use Christianity as a means for achieving noble political and social ends, we risk losing sight of Christianity’s true purpose.